The oil price shock is affecting the oil patch. Companies are going under with most of the defaults in 2015 associated with commodity and energy names. Oil workers are getting cut with above average lay-offs relative to other economic sectors. However, the rest of the country is enjoying low oil and gasoline prices. Price decline shocks are always a trade-off between localized negative effects and positive macro effects. What will surprise markets are the secondary effects, the spill-over to other sectors which were not expected. We think housing markets in Texas and other oil regions may be affected. 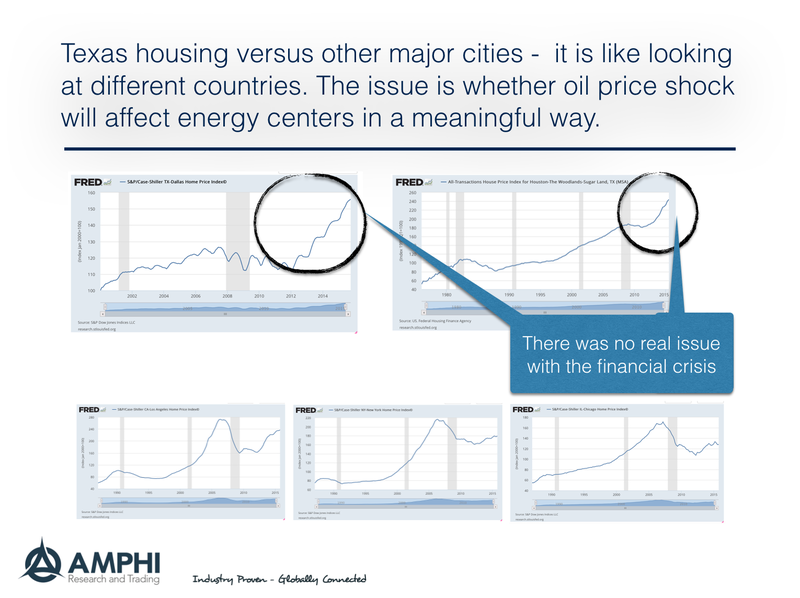 Just look at the price indices for Dallas and Houston versus the other major markets of New York, LA, and Chicago. Texas housing has actually increased its momentum since the Financial Crisis. The other three major cities have not matched pre-crisis highs. We know that Texas is a much more diversified economy than during the oil shocks of the 90's or the 80's, but on margin, a flattening of housing price increases will have a meaningful economic impact on a key region. At a 2% growth economy, small regional changes will have a greater impact on the overall economy. 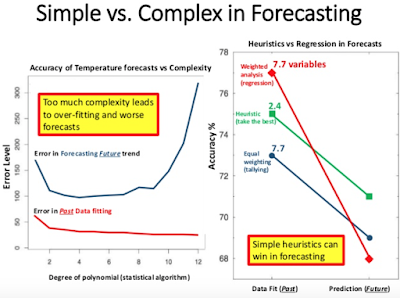 While it has been argued that simple rules for forecasting do better than complex rules, many are skeptical of this conclusion. There is the view that to compete in competitive markets your edge should be complexity. However, the data just does not support that conclusion. It is better to follow the advice of William Ockham. My confidence in simplicity is not based on a belief but on data that supports this conclusion. A recent paper by Kersten Green and J. Scott Armstrong called "Simple versus Complex Forecasting: The Evidence" shows that when direct comparisons are made simple wins. 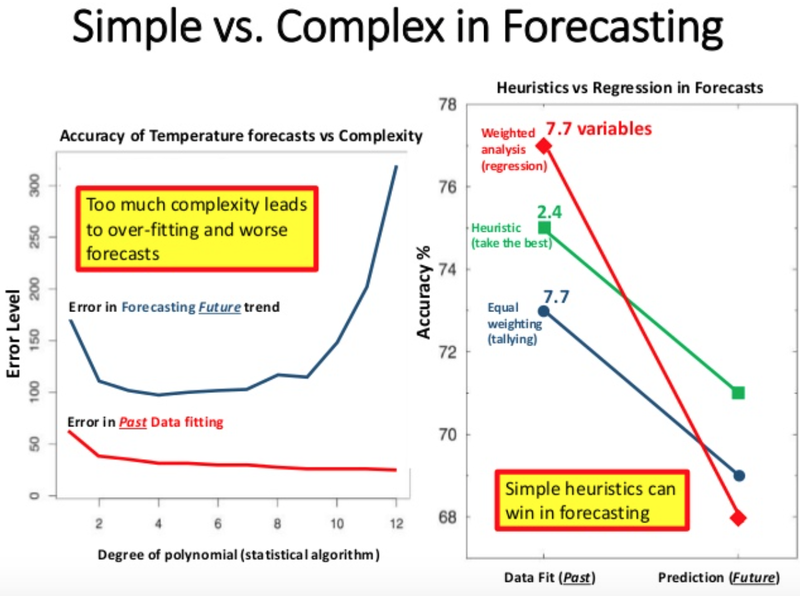 papers provide a balance of evidence that complexity improves forecast accuracy. From older work, there has been a clear conclusion that forecasting errors increase with complexity. There is a problem with overfitting. Similarly, the models that are fitted best in-sample do worse out of sample. There are number of complexities with testing this simplicity hypothesis but it does provide an important benchmark for model building. If you don't have a good reason for adding complexity, keep it simple. Even if you have a good reason for complexity, bias in the direction of simplicity. Fed forecasts - Do you believe in a Goldilocks economy? Looking at the projections of the Fed for 2016 and beyond can provide a starting point for private projections with the "big three" forecasts of growth, unemployment, and inflation. Should it not surprise us that the Fed believes all three are going to be exactly where they should be for the coming two to three years? Of course, they have to believe their generated forecasts or they would not have raised rates. In spite of starting to raise rates and forecasting four rate increases for 2016 as measured by the SEP, the Fed thinks growth will be stronger and be above 2% for the year. Unemployment will continue to decline and stay below 5% for the the long-run. Inflation will surge in 2016 and hit the 2% target by 2018. Investors have to ask three questions. Do you believe that growth will rebound in 2016 and stay at or above 2%? Do you believe unemployment will decline further and then flatten and stay below 5% for the next three years? Do you believe inflation will surge in 2016, but stay close to 2% by 2018? My guess is that you don't believe these three are possible. In fact, I would argue that at least 2 of the 3 will be outside their shaded range and that the Fed forecasts will be out the window by this summer. The question is what is the market discounting and whether there is much value with following the Fed forecasts. I think any investor should follow the Fed forecasts at their own peril. Remember the KISS method for modeling and decision-making? Keep It Simple, Stupid! 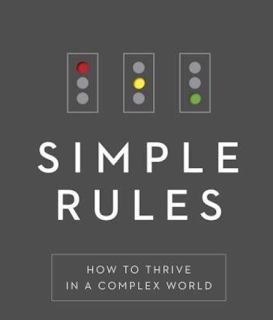 The quick and easy read, Simple Rules - How to Thrive in a Complex World by Donald Sull and Kathleen Eisenhardt, two leading management gurus, more fully develops this key concept. 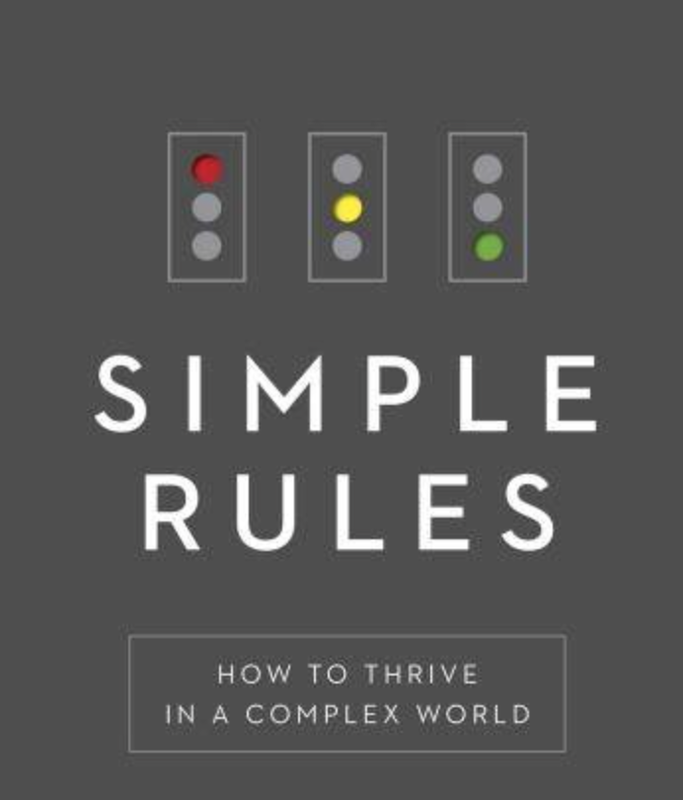 Their premise for good strategy and management is to celebrate simplicity through the use of rules that can be easily implemented and remembered. When there is a lot of uncertainty, making your decision more simple is better than trying to develop more complex processes to find a solution. Rules of thumb are useful when there is a high degree of uncertainty from a shortage of information and time. When you think about the degree of uncertainty and complexity with investment decisions, it seems natural that a rules-based system should be considered and provide support to money managers. Simple rules work because they do three things well. First, the set of guidelines are limited to just a handful of decisions. There is not a lot of decisions that have to be made, so actions can be taken quickly. Second, good simple rules are tailored to specific situations. There is not an attempt to generalize for all tasks. 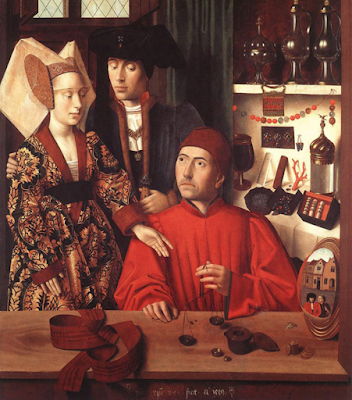 For money management, the rules are specific to money management. Third, simple rules try to eliminate bottlenecks in a decision process so there is not over-analysis. This is why they will be effective when there limited time. You avoid over-thinking a specific decision. They provide guidance but do not have to be overly prescriptive. Rules have structure and can be categorized. There are boundary rules which help limit the scope of the problem or decision. For example, the trend-follower will only look at price trends. This rule simplifies how decisions will be made through setting boundary of what will be looked at. A second category is prioritizing rules or ranking. In the case of the trend-follower, it could be the criteria for determining a good trend. The third set of rules deal with stopping. In our example, it will answer the question of when should you get out of a trend or stop the process. The final set of rules is coordination or how rules tell others how to work together. For the trend-follower, this could be the process of setting a portfolio or coordinating the activities of multiple trends. Make is simple. Keep it simple. But adapt when necessary. This is a good framework for anyone who is faced with a complex problem. The key to active management in many markets may not be alpha generation, but beta avoidance when the market declines. Just avoid the pot-holes when the market declines and you will do a good job preserving long-term wealth. Preserving wealth during the occasional big down moves is more valuable than generating alpha every year. It is just that those times of large downside risks come infrequently, so you have to be prepared with a strategy for when those big negative events occur. However, it is not easy to prepare and wait for the big event at the expense of trying to find those special alpha opportunities everyday. The focus on downside protection is simple. The magnitude of a down market event is significantly larger than the alpha that can be made from specific asset selection. Size matters. Avoiding a bad security selection when it may be less than 5% of the portfolio is not as important as getting out of beta exposure that could represent well over 2/3rds of the total market exposure and perhaps more of the portfolio risk. Alpha can be eroded over time through competition. Management of a down market cannot be minimized through more competition. The savings from downside protection is huge given the measure of volatility drag. A 20% decline needs more than a 20% gain to offset the loss. The bets rule of money management is simple, don't lose money. Nevertheless, this does not mean that an investor should play defense and not take risks. Taking risk is important. Taking away risk at the right time is even more important. There are two major approaches to downside protection or beta avoidance. One is anticipatory beta strategies which try to get out before market tops or bottoms and trend beta or projection beta avoidance which gets out after the market top or bottom based on the market trend. The market has to turn down first then action is taken. Anticipatory beta strategies may generate less volatility but is much harder to implement. The anticipatory beta will avoid the market top. Trend based adjustments are inherently more volatile but will be easier to implement. The exit could be at the same price as the anticipatory beta but after the market top. We can show the difference through a simple graph. 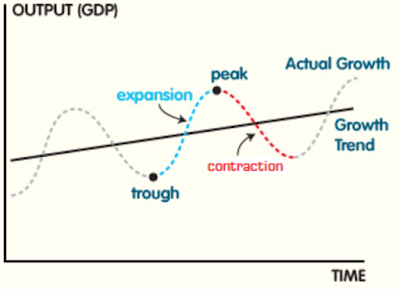 Let's look at a simple market cycle with a market top. The trend following strategy will always be late with a trade because the market has to turn down in order to sell. Trend-followers have to see the trend develop. The trend-follower will also be late on the exit from a long position because he has to wait until there is some profit give-back. Hence, there is more volatility. 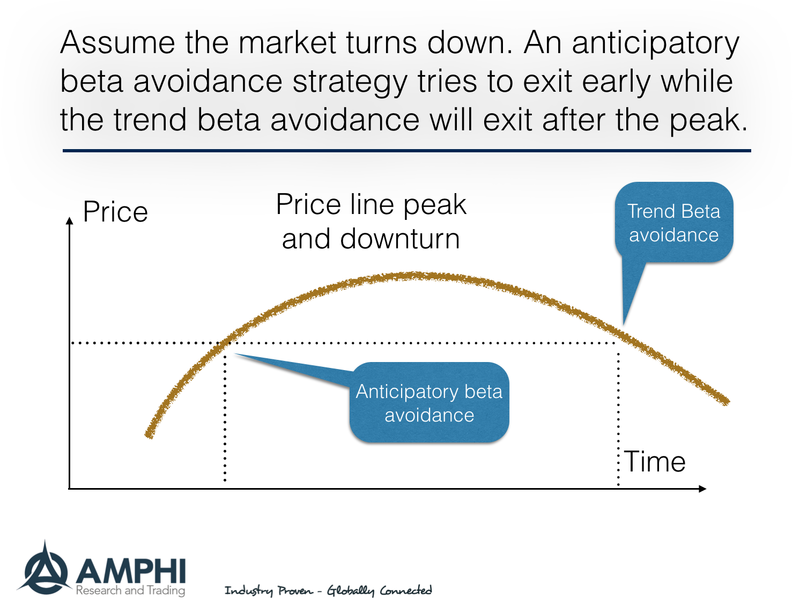 The anticipatory beta manager tries to avoid the peak and if successful will not have a profit give-back. If the anticipatory trader can exit close to the top he may be able to better profit than the lagging trend-follower. If he exists too early, the trend-follower may take more risk but end with a higher profit. The manager has to understand the trade-off of trying to call early the market top based on non-price information or accept the added ex post "risk" from trend-following but with greater certainty of the market move. The trend-follower does not believe in his ability to call tops or bottoms. The anticipatory manager has more confidence in his skill for calling peaks and valleys. The strategy choice is based on their confidence in downside management. What causes price momentum? You can define prices moving over a time period in different ways, but price momentum is the manifestation that that there is a change in the equilibrium price, or a change in supply and demand for a market. The reason for this change is the receiving of new information that will change the price. If there is no new information, there will not be a change in price. Hence, the process of how information enters the markets will define how price should move. If there is a discrete increase in information, there will be a discrete jump in prices. If there is a continuous increase or disclosure of information, there will be a continuous movement in price. This is consistent with rational expectations and market efficiency. If there is one surprise, there will be one jump in price. If there are a series of surprises in one direction, there will be a trend in price. Recent research has discussed and analyzed this issue in the context of the "frog-in-the-pan" hypothesis. If there is a continuous release of small amounts of information, there will be an inattentiveness to this news and a gradual increase in prices. This slow release of information will lead to price momentum. 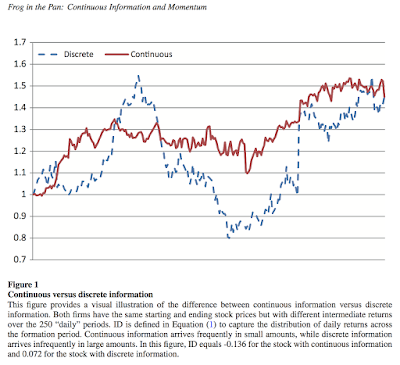 There is a link between the continuous versus discrete information and momentum. The researchers do not look at information directly but focus on the movement of price relative to the amount of up versus down days. (Sounds like a more sophisticated technical analysis approach, but we will not go down that path.) They focus on a behavioral finance explanation when I think there is a simpler story. Nevertheless, an alternative story not based on behavior has to explain why there would be continuous information flow surprises in one direction. 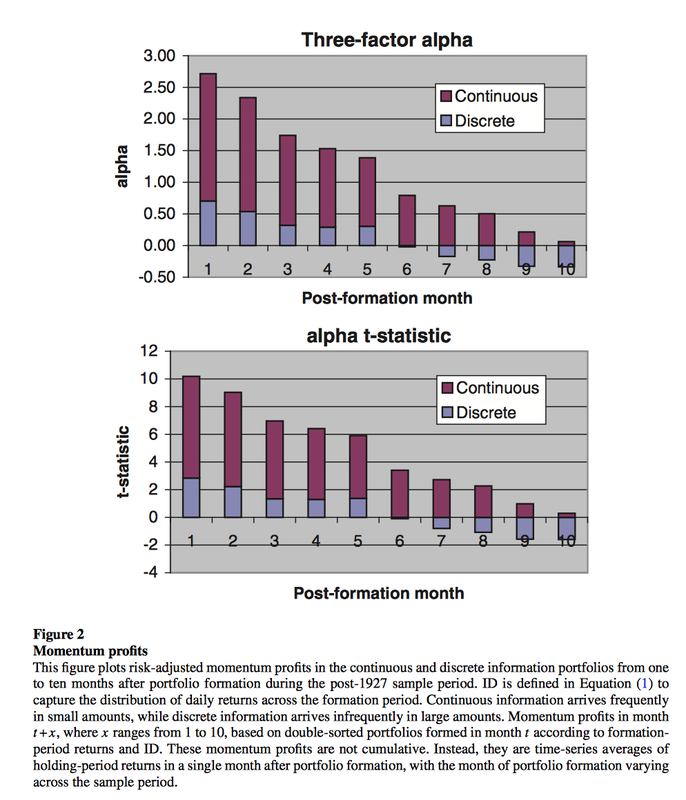 This research story suggests that continuous information releases will lead to momentum. 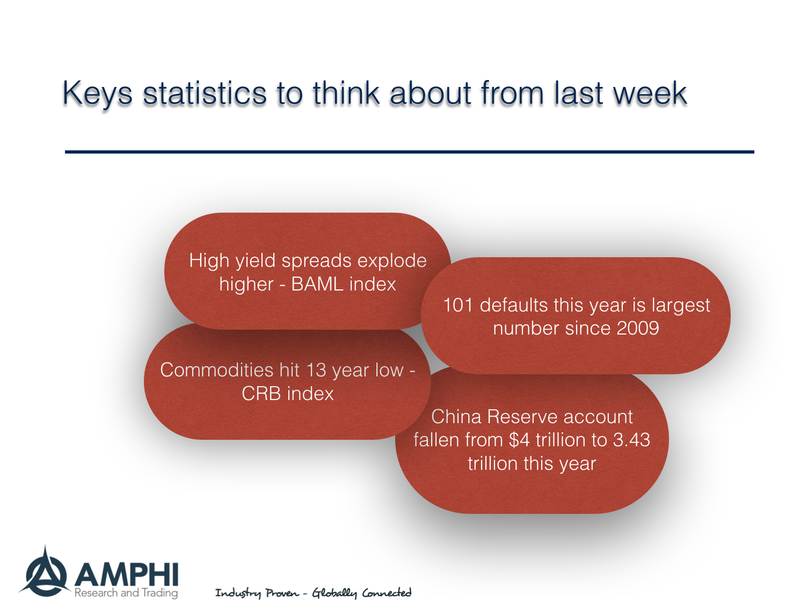 This makes sense especially for global macro investing and commodity investing because there may be more continuous information releases in macro markets. In the case of bonds, there are regular monthly government release of data that may drip new information to investors on the economy. Any one piece of information may not tell us enough about the economy to have a jump to a new equilibrium price. There may be big surprises, but it is more likely that the cumulative release of information is what affects prices. This would suggest that the regular release of information will likely lead to momentum in prices. 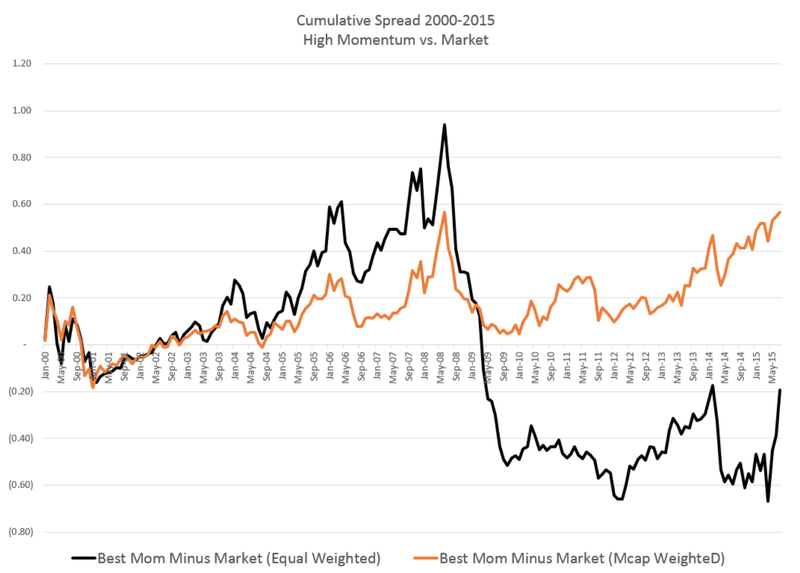 Momentum may do better in macro markets than individual stock markets. 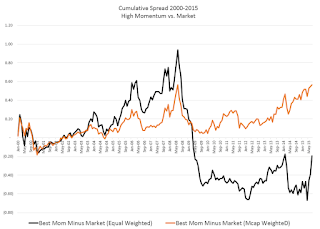 There has been a growing research focus on the problem with momentum trading. 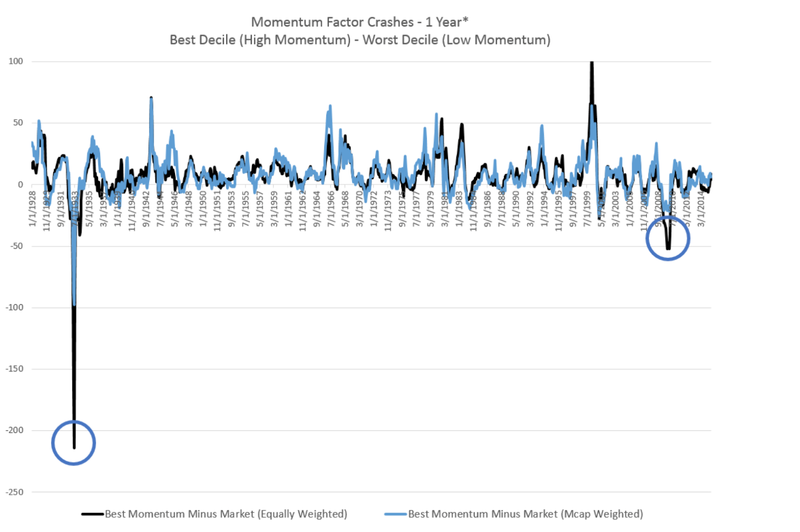 Momentum trading is subject to crashes, or to put is simply, it's good until it's not. The data is suggestive of two major problems with momentum. First, you may actually only receive higher returns because you are taking on the potential for crash risk. Second, there may be periods when momentum just does not work. 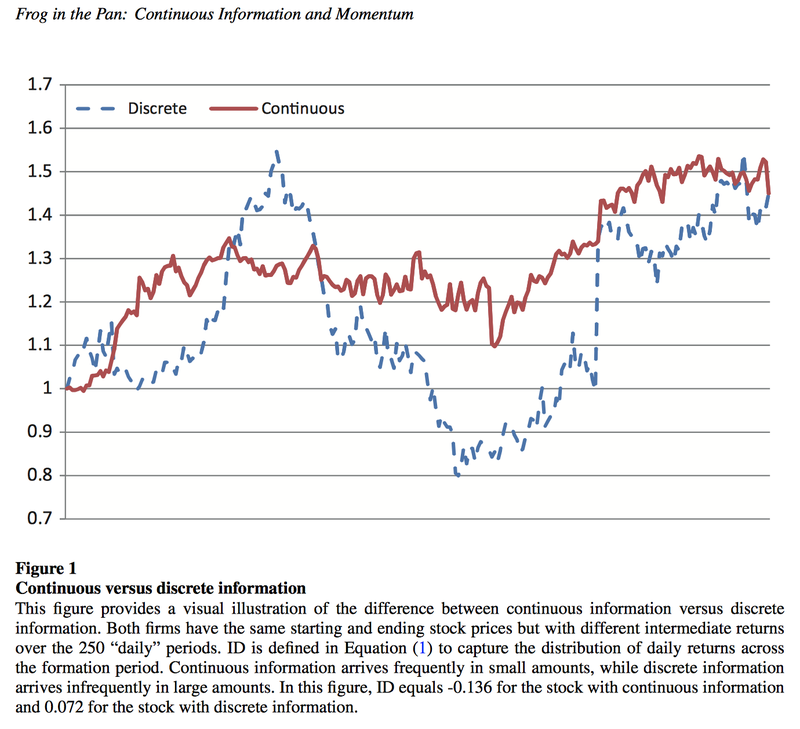 The charts below are from Patrick O'Shaughnessy's research on momentum. First, there are periods of poor performance. You cannot get away from it. It looks like these crashes come after a big market downturn, but there is limited information to classify these events. Second, if you look at high versus low momentum you will find that are extended periods when momentum will underperform. Currently, we are in one of those periods. If you avoided momentum since the Financial Crisis, you would have been better off. Is momentum one more strategy that has served its time and should now be put to rest? Yes, if you use a simple momentum approach. 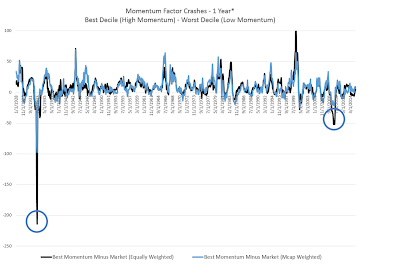 The studies of momentum crash risk do not include a risk management component. This is why risk management is so important with trend-following and momentum models. The main job of the risk management rules is to mitigate the crash risk inherent to these strategies. No investor or manager should think about momentum strategies without a risk management exit strategy. Risk management has been more important over the last five year not because of some new view of finance, but because it is critical to save managers when the strategy is not working. Momentum has been good but currently it is important to look beyond this approach. The Fed raised rates, no surprise. The Fed acted, "Move along - nothing to see here". This was the one of the most telegraphed Fed action in history, but what now? Market reaction is usually not associated with the headline or what was expected but what was occurring under the surface buried in the fine print. This FOMC meeting was all about the dots and 2016 forecasts. 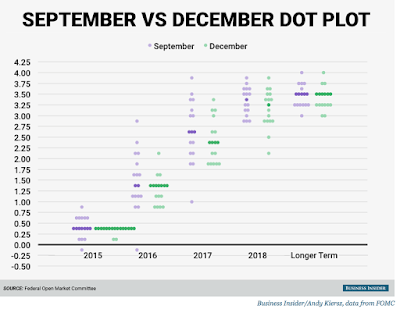 The dots of what the Fed is expecting in its Summary of Economic Projections (SEP), what the market is expecting in the Fed funds futures, what forecasters are thinking, and what may actually occur. Money will be focused on the rate path now that the first increase is in the books. 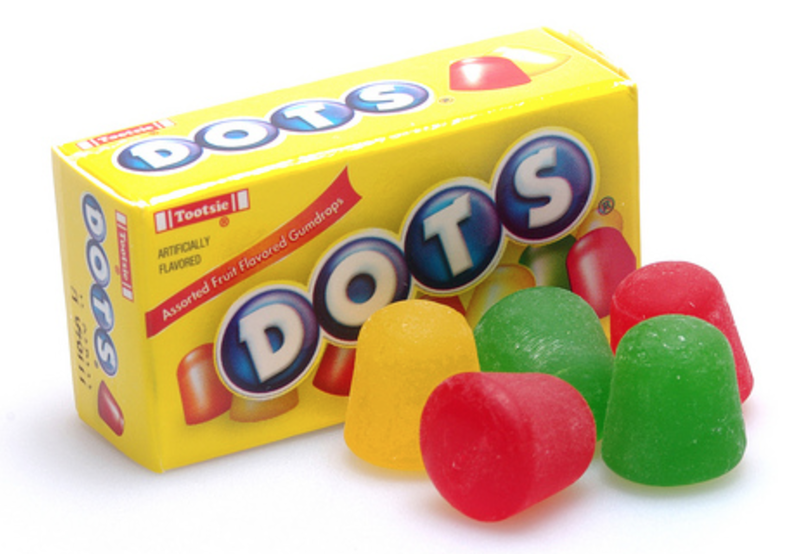 The dot plot suggests that there will be four 25 bps rate increases in 2016.This will be over 8 FOMC meetings in year. The Fed funds futures may be a little more pessimistic on these hikes. Economists are more consistent with Fed expectations, but there is a strong minority which we can call the "one and done" school. Certainly, listening to Chairman Yellen would suggest that this increase was dovish-lite with the key words being gradualism and data dependent. Listen closely and you could believe in "one and done"
What is clear is that the Fed is worried about the plumbing in the money market system with reverse repo lines being raised to $2 trillion if necessary. There is the fear that it may take a lot of work to keep repo and the Fed funds in the middle of the 25-50 bps range. There just is a lot of money outside the banking system that controls rates so the Fed has to use a lot of fire power to move rates. In fact, more investors are going to focus on the Fed balance sheet in 2016. We are back to looking at the quantity theory of money through the Fed balance sheet. This is where the real monetary expectations will be focused. There will now be a more focus on the real economy and data dependency and away from the hyper-sensitivity of Fed watching. We expect that the six to nine month Eurodollar futures will be one of the most active places of trading in all of financial futures. The bets on future rate hikes will be the big trades for the new year and where every hedge fund focused on fixed income will be placing their money. Option activity may set records and economic data will be closely linked with spread trades in ways that we have not seen for years. The data dependent gradualism of Yellen is leaving the markets uncertain. The reaction may be slow with holiday and year-end but the when traders start really thinking about market divergences, the front-end of the yield curve will be the place of focus. 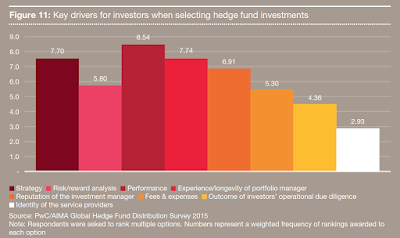 Who you know and what you do - that is the story of how hedge funds are going to raise money. 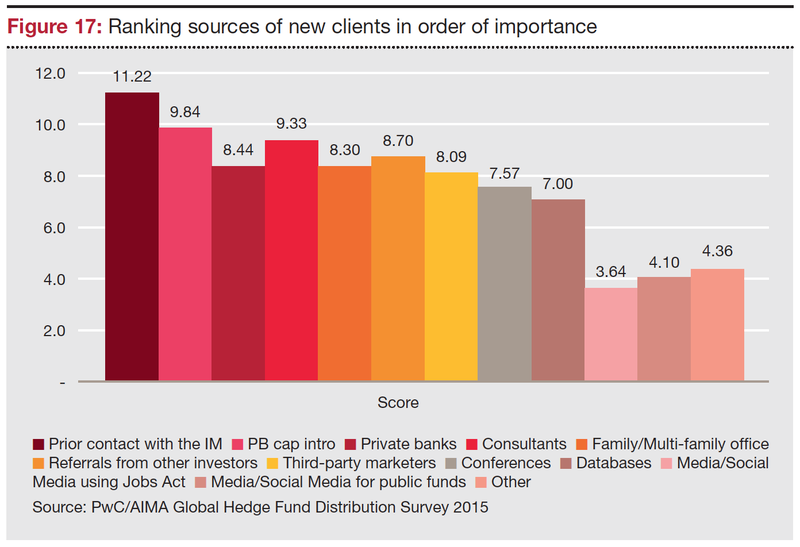 The PWC Global Hedge Fund Distribution Survey 2015 is a treasure trove of survey information on the upheaval in the marketing and distribution of hedge funds, but there are some things that are consistent in marketing. The key drivers for fund selection do not seem to change. Number one is performance, not risk-adjusted returns. Investors still have an attitude of "show me the money". Second most importance is experience, followed by strategy. Give me absolute returns from experienced professionals then we will talk about strategy and other issues. Sounds like the world has not changed. For all of the talk about new distribution channels, the number one source for new clients is prior contact with the manager. Investors need to know the manager and the manager needs to know the investors. The contact is critical. The second most important source is the prime broker. While everyone may complain about capital introduction, managers still depend on this channel for new money. Again, the world may not have changed as much. 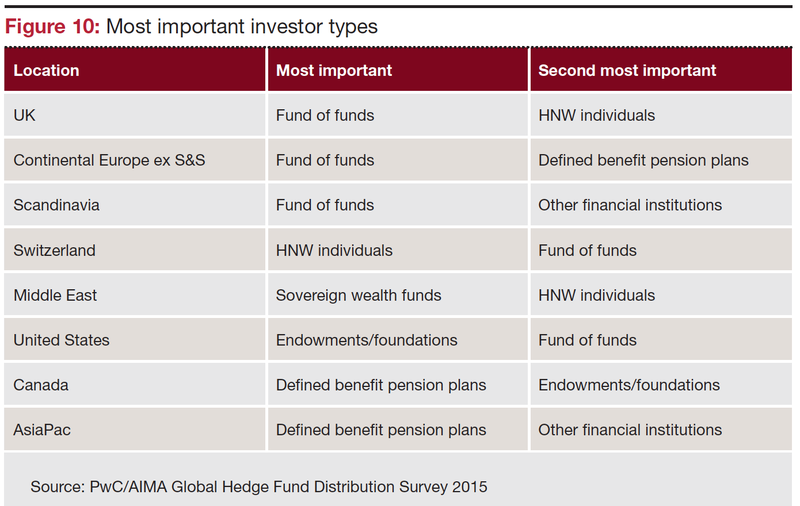 The final interesting chart are the investors types that will be likely buyers of hedge funds. For Europe, the answer is still fund of funds. 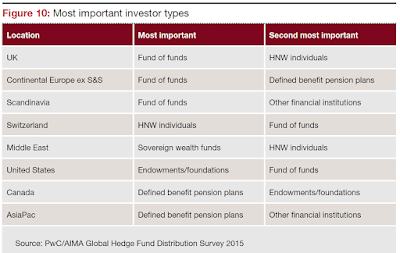 In the US, the driver will be endowments while Asia may be dominated by pension funds. Retail distribution is growing but the tradtional sources of funds are still the most important. The distribution world is changing, but if you want to raise assets, you still have to focus on "old school" marketing for 2016. We are strong believers that the first rule of global macro money management is knowing where you are not where you will be. 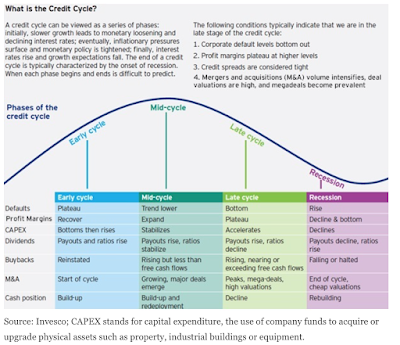 You cannot forecast correctly if you do not know your positioning in the business and credit cycle. This seems like a simple proposition but is actually much harder than expected. Financial markets are supposed to be expectational markets - discounting future events; nevertheless the discount process is grounded on current situations. If markets are cheap the discounted future value is different than if the market is rich. Current positioning scales the future and provides context. 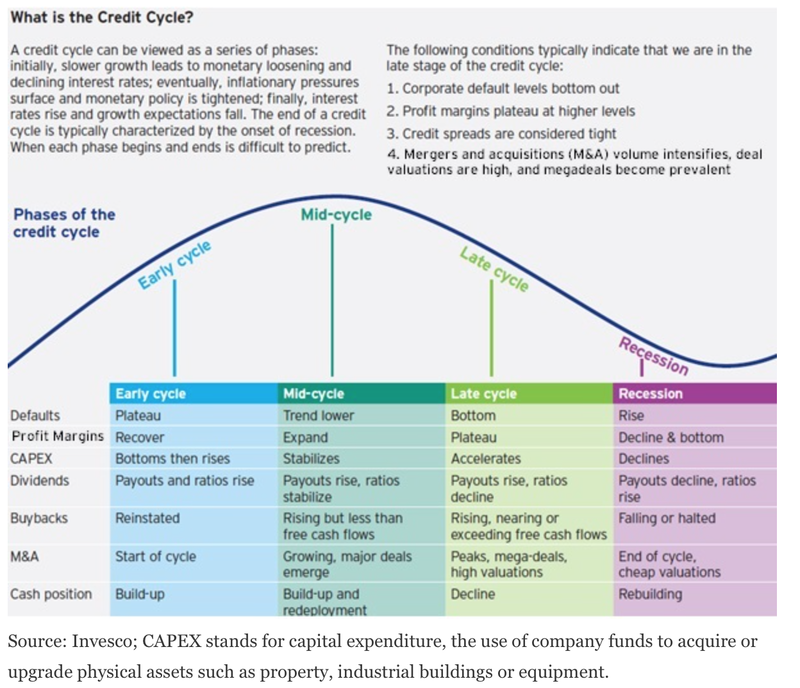 Let's take the case of the credit cycle. Defaults are on the rise. 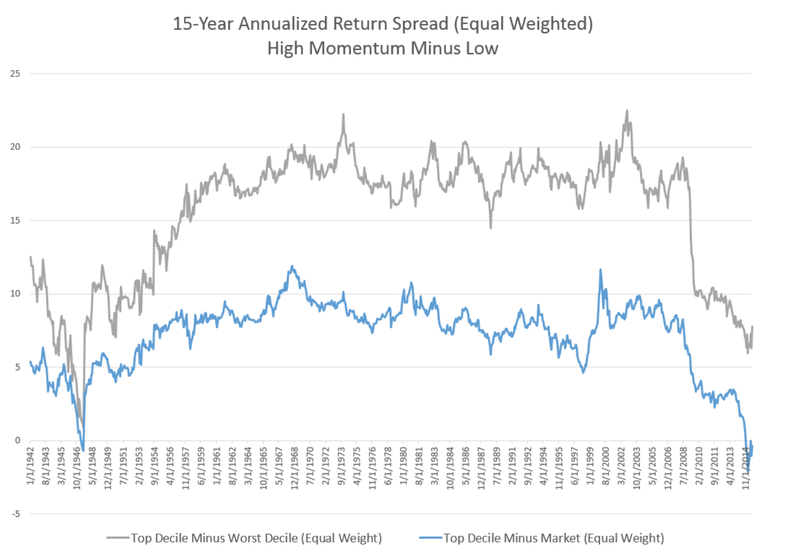 Spreads are increasing. Investor capital is moving out of the sector. CAPEX is declining in some key sectors. Rates are moving higher. On the other hand, buybacks are continuing, M&A is still robust, and cash positions are still high. The consensus is that we may be late in the cycle, but this positioning is subject to debate. If you believe the late credit cycle story, it is tile to start moving out of the sector. 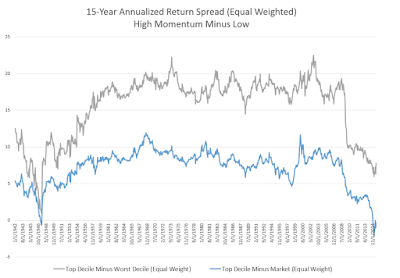 If you are less confidence of current positioning, there is a buying opportunity at spreads more attractive than a year ago. We are not arguing a specific point of view but rather a framework for looking at the world. That framework focuses on the today and not the tomorrow. "Diversification across assets does not necessarily imply diversification across risk factors and it is risk factor diversification that determines return outcomes, especially during systemic risk events,” says Andrew Weisman, CIO of Janus Capital Management’s liquid alternatives funds. Weisman capsulizes the "new school" of diversification which focuses on risk factors and not asset classes. 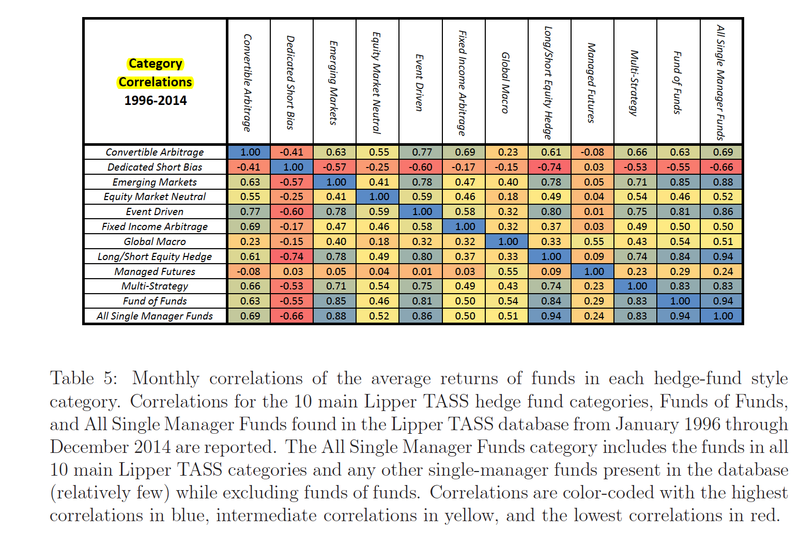 The old school just looked at correlations across returns and not at the drivers of those returns. When the drivers became similar like at turning point in the business cycles, assets become correlated. When inflation shocks occur, returns correlate. The new school says that you need to know the drivers or risk factors because these are what will cause correlation changes. Of course, the problem with the new school is that we still may not have a good understanding of how to forecast these risk factors or even measure some of these risk factors. What is the right inflation measure for an inflation risk factor? 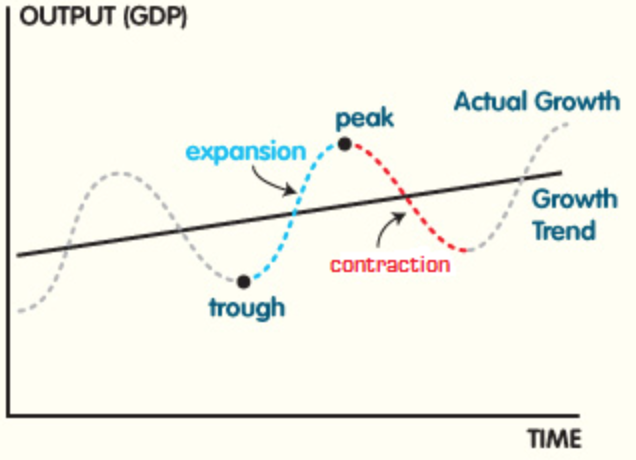 what is the right growth measure for a business cycle risk factor? We could say that global macro investing is fundamentally about the identification and forecasting of risk factors. If you get these risk factors right, you will be able to tilt asset allocations to your advantage relative to those who just diversify on historical. Unfortunately the movement to the new school has the some of the same problems as with the old school diversification. It is hard to measure the sensitivity to risk factors just as it is hard to measure changes in correlation. When there is a transition schools of thinking, the measurement and process for implementing the new view will be messy. The shift will be especially messy when global markets are in upheaval, but this process toward the use of risk factors will continue. One of the tenets of capitalism is the close association between growth and economies of scale of firms. Because of economies of scale, firms push for growth in an attempt to lower costs and drive competitors from business. It is the brutal part of competition - grow or die. This competitive drive for growth is not faced by the skilled artisan who produces goods that cannot be easily manufactured or generated through scale. 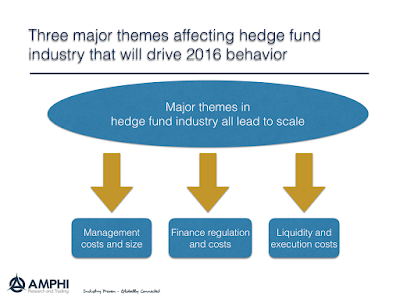 Additionally, the institutionalization of the hedge fund industry has moved it from a clientele of sophisitcated investors to a much broader base for the masses. The requirements from due diligence have also required scale to spread the costs and meet the growing demands for operational structure. 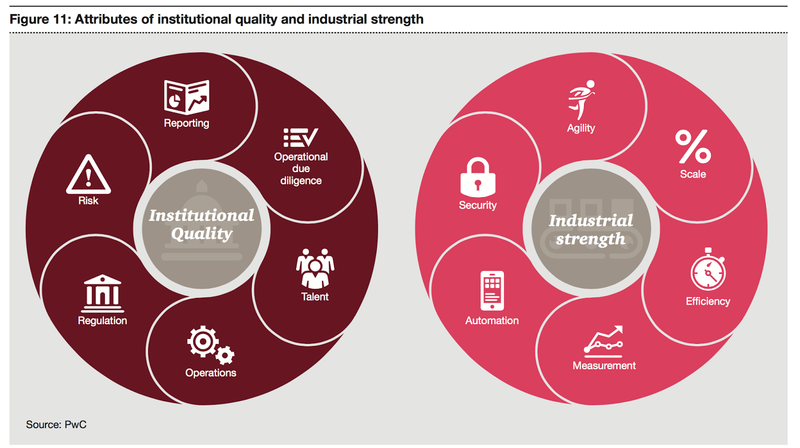 This dynamic environment provides background for reading PWC Alternative Asset Management 2020, another forecast for the alternative asset management industry. 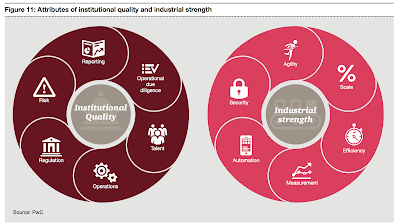 PWC uses an interesting catch phrase, "from institutional quality to industrial strength", to describe the direction of alternative investments. The artisan does not have industrial strength. There may be both more standardization and customization but this is just a response to commoditization. Economies of scale lead to commoditization and in an effort to stop the cycle of lower fees, managers have focused on customization. 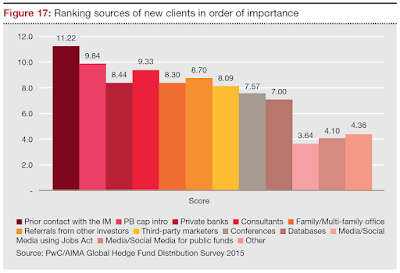 The picture for the alternative investment industry is much grimmer than portrayed in this look into the future. Competition will squeeze the artisan manager. In some cases, this will be good, but it will leave an industry where the average size firm is larger, fees are lower, and uniqueness is rarer. There were four key stats or factoids that caught my attention this last week. 1. High yield spreads have exploded higher. We are now at the highest levels since the Financial Crisis. The only times the market has gotten to these types of levels were during or right after a recession. 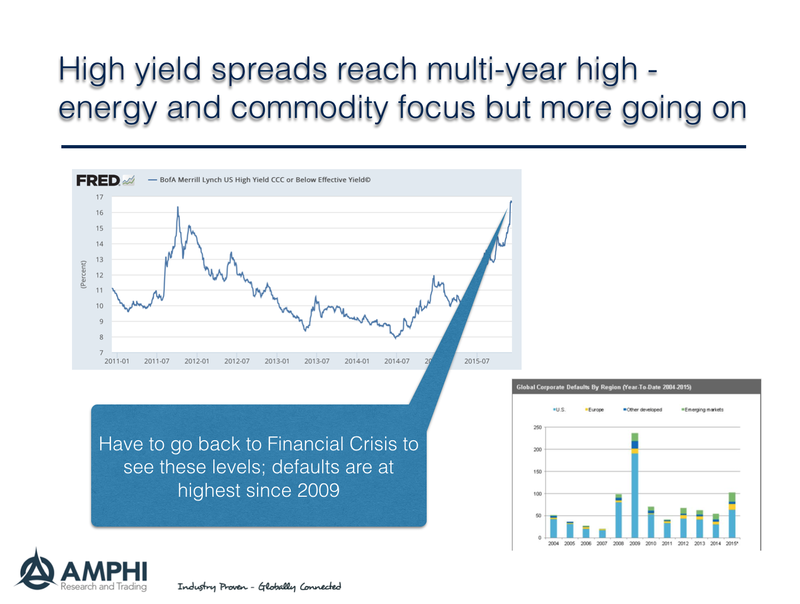 At this time, the reach for yield is over for high yield. 2. 101 defaults this year, most since 2009. The defaults have been centered in the energy and commodity sectors, but it is still disruptive to the overall global economy. The impact of the credit problems in energy seem to have had a contagion to other sectors. 3. Commodities hit 13 year low based on CRB index. This is not a Financial Crisis problem. This is not a short-term inventory problem. This is a reversal of the super-cycle and it may not be finished. Technology has lowered costs, so production in many commodities has continued even with massive price declines. 4. China's foreign reserves fell again last month. Their reserves have declined from just under $4 trillion to $3.43 trillion. It is likely that 1/3 is from changes in valuation, but the market has been seeing a steady decline that ripples through capital flows and the holders of assets. The pressure on the yuan will continue. The reserve outflows are being sterilized but this is a dislocation that have to lead to price adjustments. The month really began with the ECB announcement of lower rates and QE extension and will end with the FOMC meeting. 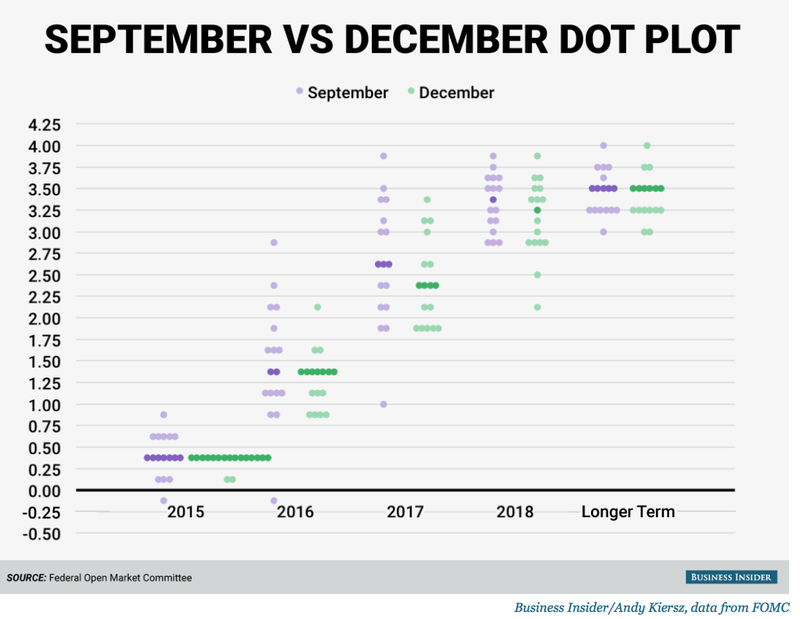 Of course there will be almost two weeks left to the end of the year but with holidays coming, there will not be any new information that will drive the markets. Firms will start cleaning the books and preparing for 2016 where the major macro theme will be the Great Divergence in monetary policy between the Fed and ECB and to a lesser extent other central banks. This is a crowded trade but will still be the macro focus for most of the year. 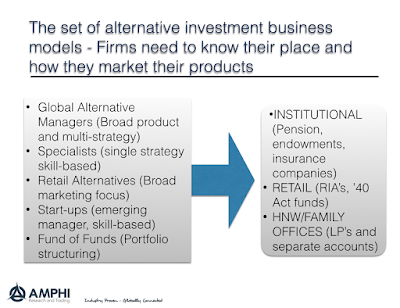 Current business models in alternative investments - all about gathering assets? 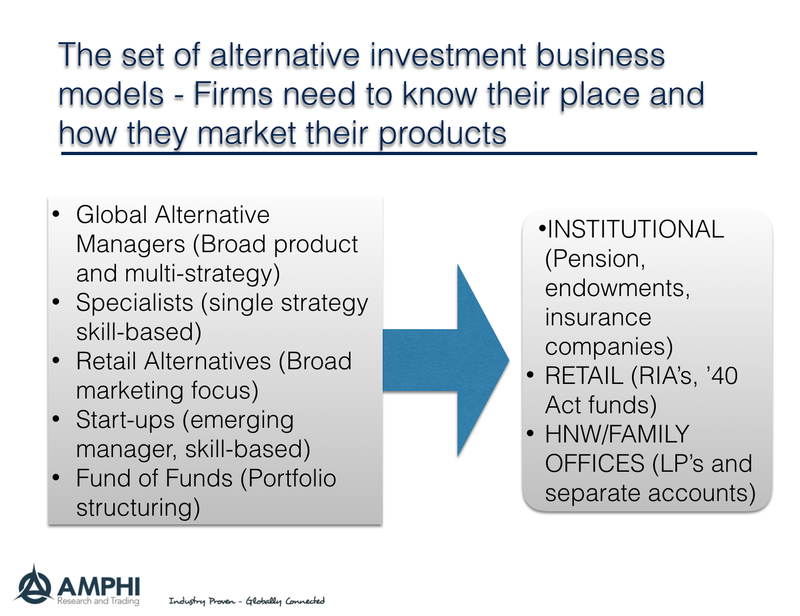 There is a wide set of business models in the alternative investment industry. The WEF's Alternative Investments 2020 - The Future of Alternative Investment provides a good framework for how hedge funds can be classified through their business model. Most began as start-up, but have now moved either into global alternative firms or specialists. 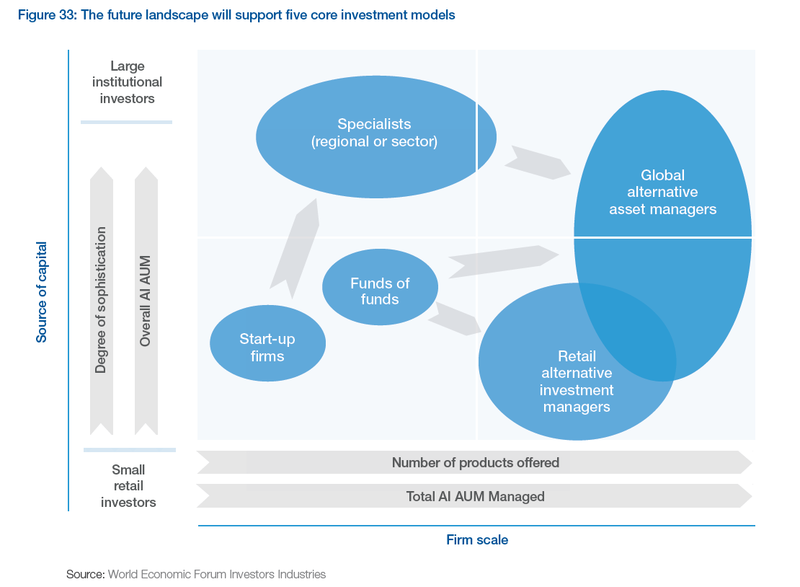 This is similar to the traditional asset management world where the differentiation is based on either asset gathering or skill-focsed as a core approach to business. The fact that more firms are moving away from a skill focus suggests the direction of the alternative investment industry. Alpha may be important, but asset gathering may be the greater goal. This could be a reason for why hedge funds have not been performing as well as when they were small and solely focused on return generation. Not until you look at complete set of regulation to do realize how much the financial industry has and will change over the last 5-7 years. 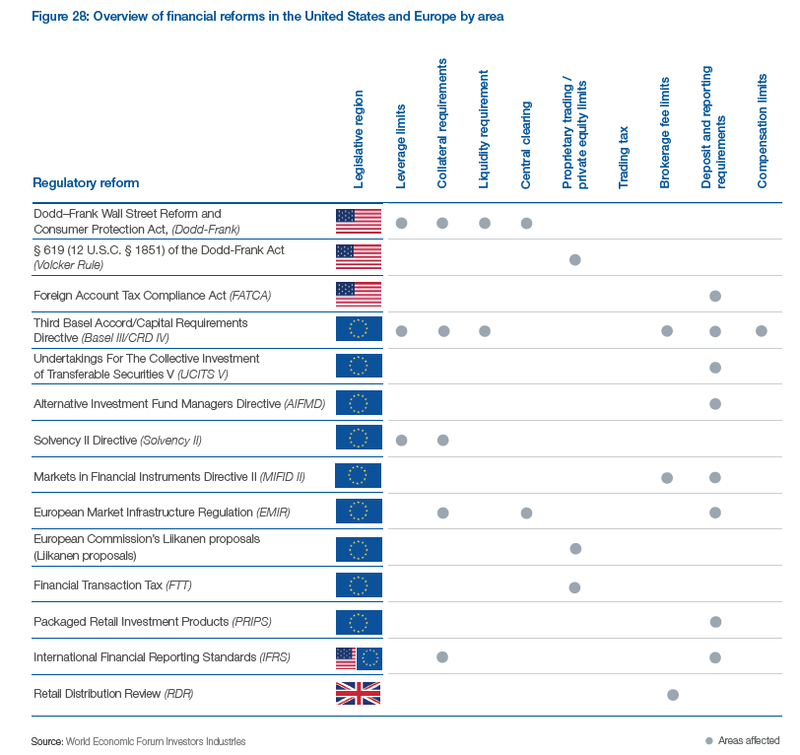 The World Economic Forum paper - The Future of Alternative Investments provides some good graphics on the amount of regulation. These will have a huge impact on all parts of finance. 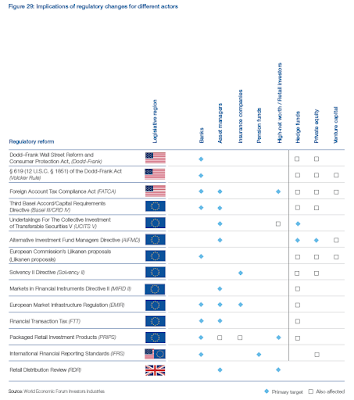 Alternative investments will not be immune to the new regulations in the US, EU, and Great Britain. Costs from regulation are going up while fees are going down. This causes the alternative industry to move to a scaling model. Firms have to grow to pay for this oversight. Perhaps the Great Divergence in monetary policy between the Fed and ECB is not a great as expected given the weaker than expected policy change by the ECB, yet 2016 will continue to be the story between the Fed raising rates and the ECB pushing interest rates further into negative territory. Right before the ECB announcements the interest rate differential between Germany and the US was at the widest level since the introduction of the Euro. Yields in the EU jumped up and the Euro had one of the biggest positive days since its inception on the announcement only to see ECB president Draghi suggest that there is "no limit" to what the ECB will do to help the economy. The high volume of activity coupled with the price moves tells us that that many are trading this differential closely. Some of the most liquid markets in the world may still face cascades when these crowded trades are surprised. Assume that the Fed raises rates in December, the focus for most of 2016 will be with the path for futures rate changes. Similarly, the EU focus will be on the success of ECB's QE program. We have moved from the Fed's QE of yesterday to the ECB's QE of tomorrow. Getting this trade right is a global macro requirement for 2016. The currency markets will have to assess the Chinese coming out party from its inclusion in SDR basket. SDR's are a unit of account that have not taken the global markets by storm, but this places the Renminbi into the Big Three of currencies -The dollar, Euro, and Yuan. There will be more focus on what the Chinese currency will be doing, what the PBOC is doing, and the role of China in international lending. This is why we placed the words financial statecraft in the title of this section. Currency traders will have to have an opinion on China - from growth, to PBOC policy, to currency moves. If you are involved with currencies, you will not be bale to avoid having a China opinion if you do not trade the currency. Don't worry, that effort will not be useless. 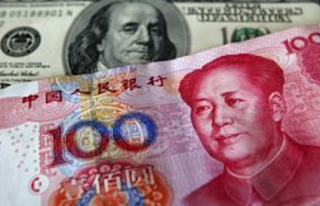 Most currency traders will be trading Renminbi soon enough. The commodity markets continue to go down in response to the declining growth in China and the rest of the world. The super-cycle talk is long over, and we are in different commodity world. There has always been the view that supply and demand for commodities have been relatively inelastic both in the up and down direction. The surprise over the last few years, especially for the energy markets, is that private market supply is more sensitive to price than what we may have thought. This is especially the case with bringing on new production. We have also found that supply that is not sensitive to market prices because marginal costs are low will destroy the rest of the market. Economics 101 told us that, but the markets have been surprised by how quickly producers can reduce their marginal costs over the last few years. In the case of low cost non-private producers in Middle East, low costs have made them willing to ride the price declines with production increases. The shale oil boom has been about how oil men were able to take bank financing, punch holes in the ground and get oil and natural gas on-stream quickly. The decline in price is about the battle of those who can generate supply quickly against those who want market share and don't care about price in the short-run, the Saudi Arabia. OPEC is broken because no one can impose discipline on producers. For the rest of the commodity markets, traders have been surprised how quickly producers can adapt to changing market conditions. We have also seen the elimination of crop seasons. Corn and soybeans are both Northern and Southern hemisphere crops. Coffee is grown around the world. Sugar comes varied sources. Wheat production is grown in various crop centers. The high dollar has made it possible for other countries to sustain production. Technology and storage innovation have allowed producers to continue to generate new supply in the face of falling prices. 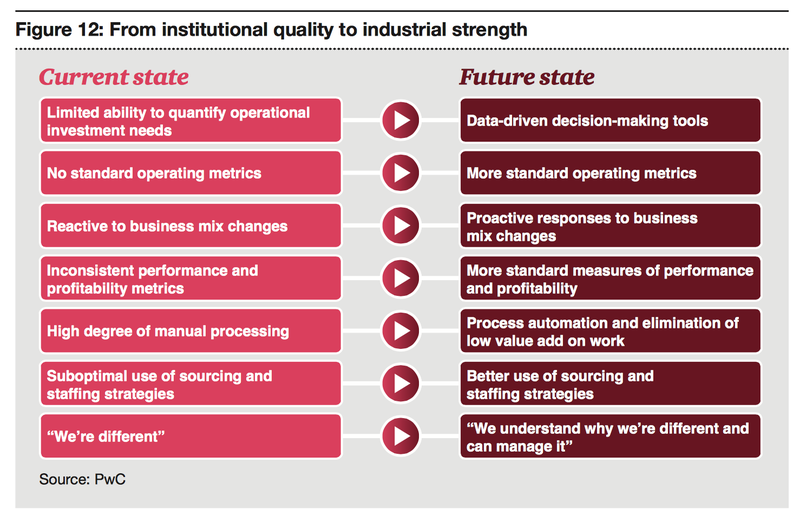 What we have seen in manufacturing we are now seeing in commodities, an adaptable just-in-time production world. Be ready for surprises from adaptation in a low commodity price environment. Economies of scale become even more important when there is a down year with less manager return dispersion. When there is a down year for many hedge fund styles and managers like what we are likely to see in 2015, the power inherent in economies of scale become even more acute. When performance is down, there will no incentive fees to lean on to help pay the bills. This issue is especially the case for smaller managers. Small firms cannot use the incentive fees to recoup their start-up costs and management fees are just too low. Down years also lead to more manager switching, so marginally sized managers who lose assets will be harmed more. If there is little dispersion in returns, investors will use other criteria for determining investment decisions. Size will matter more in these cases. What you gain with economies of scale in up years, you lose in down years. Fixed costs are harder to cover. The industry has seen some large fund closings especially in global macro. While these firms were big, they were not able to generate the internal returns necessary to pay talent, generate future returns, and cover all costs. If alpha is harder to identify, there needs to be more talent at work which increases the fixed cost of doing business. To gain scale managers are offering more products which actually may dilute the talent pool. If there is more fee compression, larger firms will be better able to either sustain a fee cut. Surprisingly, larger firms have been able to maintain fees better than small firms which is another scale problem. With the retailization of funds, scale is also more important in order to have the marketing to reach smaller investors. Expect more firm closings and greater average size for managers. Talent in small firms will be harder to find. It is generally found that more regulation places greater cost on small firms than large firms. Hence, there is a greater pull for scale because legal and compliance staffs are a necessary fixed cost. We are not arguing about the efficacy of any regulation, but it has clear impact on the cost of doing business. Firm failure, fraud, and financial contagion also have high cost, but it is not clear how the costs benefit analysis has been done. The regulation of banks and other financial institutions leads to carry-over effects on all money management firms. Prime brokerage and clearing becomes more expensive. Bank have to hit higher capital requirements and ROE targets in the current environment. This also drives the industry to seek scale. Consolidation because of clearing and regulator costs will affect all hedge funds and lead to firm consolidation. There has been more discussion on liquidity in different markets. We have seen flash crashes in all of the major asset classes, equities, fixed income, and currencies. 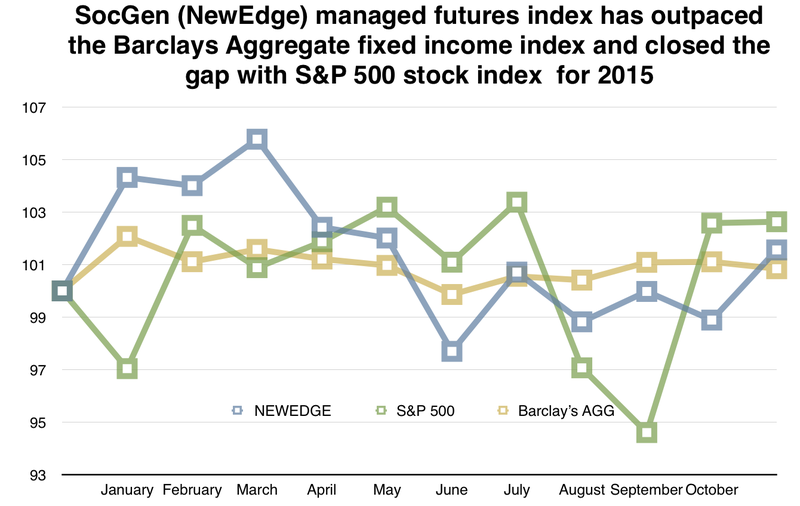 The money management and hedge fund industry have taken note of the potential problem. We have seen special round tables within the CFA to discussion corporate fixed income liquidity. The Fed has focused research to determine whether there is a liquidity proble in key markets. There answer is no. 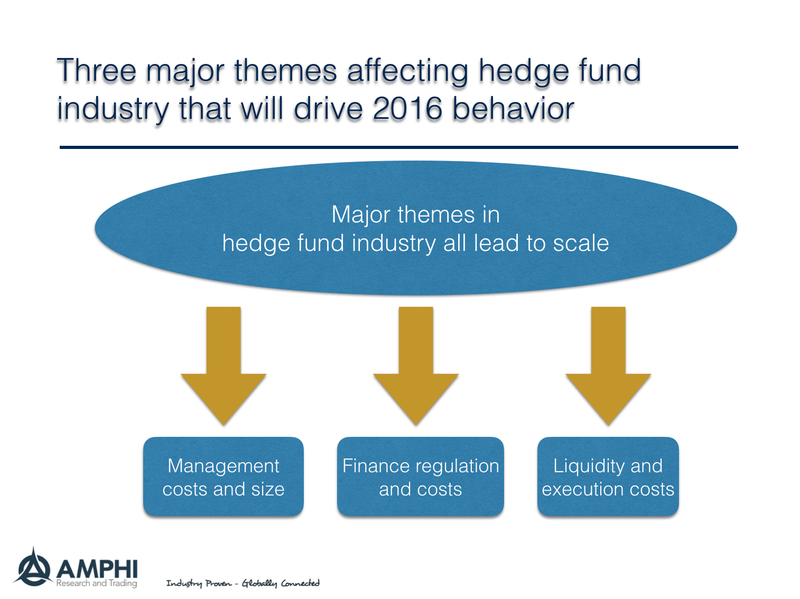 All this means is that trading and liquidity decisions will be more important in 2016. There will be more effort to improve the execution process but this actually may be at odds with trends in regulation. At the same time, the open outcry trading floors have closed in Chicago and there has been more government scrutiny and prosecution of HFT traders and dealer manipulation. Algo trading is still growing but there is a new air of caution conquering what can be done to send and pull orders from the markets. More money will be spend on better execution. This has the potential to improve returns, but it creates another barrier to entry for the small firm that does not have access to technology. Get bigger or you will be crushed under scale, regulation, and execution costs. Most investors have likely past over the stories on the IMF's inclusion of the Chinese Renminbi in the basket for SDR's. The change in SDR weights will take effect next year. This is boring stuff for even some specialists in international finance, but in reality, it is going to have a great impact around the globe. SDR's are a supplemental international reserve asset which is allocated to IMF members in quotas as an alternative reserve asset to dollars, gold or other currencies held by a central bank. It is used as the IMF's unit of account and as method of payment across central banks. To be considered as a member of the SDR basket sends a clear signal to the financial world that you are an important currency in the global marketplace. To be a member of the basket, an currency has to be "widely used" and "freely usable". As the largest exporter in the world, the Chinese currency is widely used and notable in trade discussions. The second criteria of the Renminbi being freely usable is a little harder to measure albeit the IMF has a set of criteria. The currency is not fully convertible, but it is moving in that direction. The Chinese economy is certainly more important than the yen and sterling, currencies both in the basket. The new SDR weights has the Renminbi at just under 11 percent. The new basket weights really hurt the non-dollar currencies. The euro loses 7% of its allocation, sterling 3% and yen 1%. Many central banks are going to start to reallocate their reserves to include Renminbi and will be selling the other reserve currencies to more closely match the SDR allocation. There will be a higher demand for CNY just when many think it will have to fall in value to help the domestic economy. More importantly, we will see traders start to think about their view of Chinese currency and whether they should trade it. For a government and central bank that likes control, this is going to be something that the Chinese will have to get used to. The PBOC has the view that markets should be able to find their equilibrium level but not too quickly and certainly not in the "wrong" direction. There will be a greater international focus on the big three currencies - dollars, euros, and yuan. This focus will especially be the case for emerging markets where China has made sizable investments and lending. The pull for payments in the Chinese currency will grow substantially. Clearly, the Renminbi's importance in trade is greater than its importance in finance, but that gap will be closing and investors should follow this trend. The Chinese will be a major voice in any international finance discussion. A good stating point for any discussion about alternative investments is defining terms and providing a classification system for strategies. Without definitions and classifications, no serious discussion on costs or benefits can be undertaken. 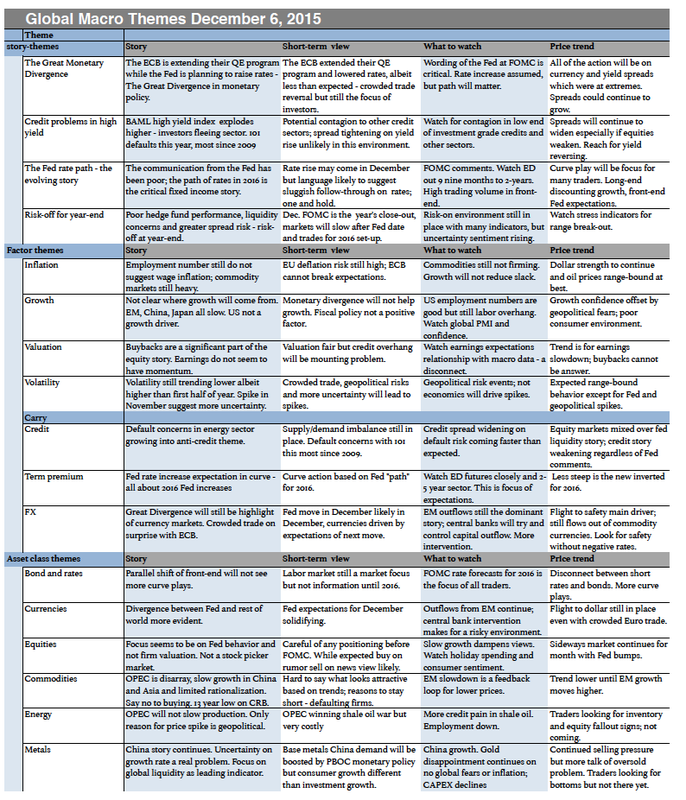 Putnam Investments has done a good job of providing a useful framework. This framework further moves the discussion forward through providing an analysis of which strategies do well based on different economic environments. This look at conditional behavior is a good research advancement. The Putnam breakdown is a deeper take on the CAIA classification system of substitutes and diversifiers. Here the main breakdown between "zero beta" styles and volatility dampeners which could be a proxy for substitutes. The inflation hedge and return enhancers are more outlier to the first two categories. It is notable that Putnam and CAIA place global macro in different buckets. This is why thinking about classifications is important. Breaking down behavior across the 2x2 matrix between up/down growth and up/down inflation shows that performance will vary with the economic environment. Having an economic view will impact the allocation and performance of alternatives. Nevertheless, the best combination is to look at return enhancers like private equity and risk reducers like multi-strat and global macro. This seems consistent with the behavior of many pension plans which have moved into private equity and have kept allocations to global macro as a risk offset. We conclude that just holding a diversified basket of alternative investments is not good enough in a changing environment. Investors still need to have an economic view to get the most out of their alternatives portfolio. 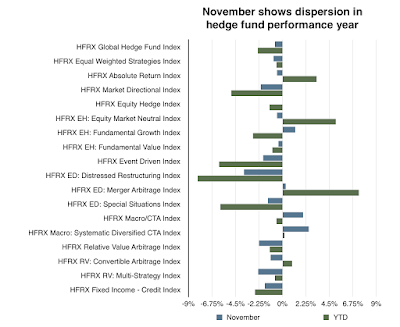 Hedge funds showed more dispersion in performance in November with managed futures and global macro generating good returns while the remaining hedge fund strategies generally losing money. Both equity and fixed income related strategies underperformed and multi-strategy managers had a poor month simple because they have a tilt toward equity trading. The market was punctuated by the surprise in the employment number at the beginning of the month with a spike in volatility. The flat performance in equity indices for the month as well as the falling trend in volatility masked the chop within the month that caused the trading loses. 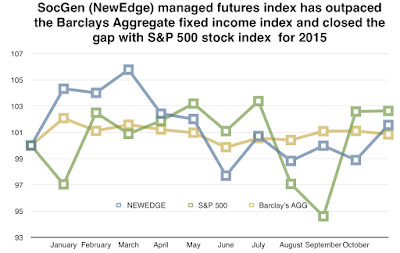 More diversified strategies like managed futures did better even though there were more shallow trends. 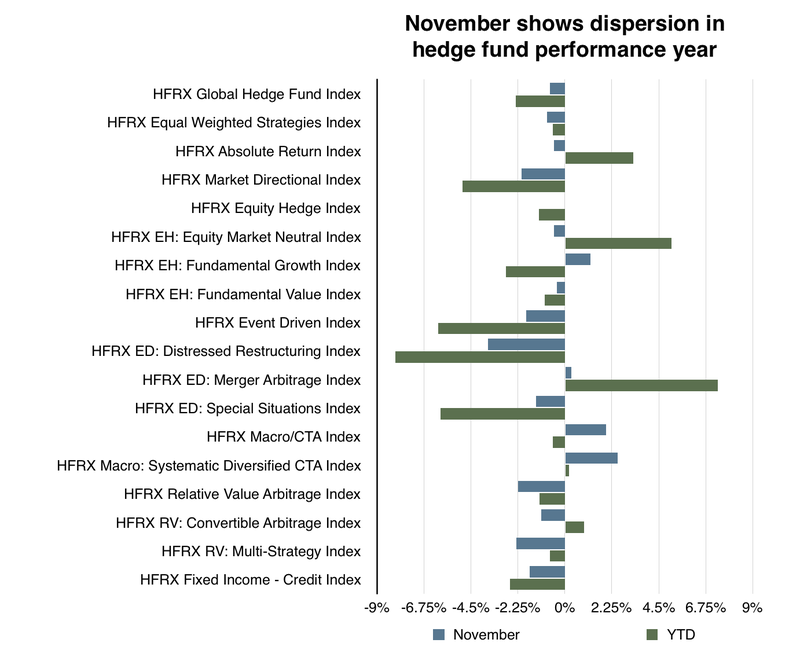 The year to date performance of hedge funds is now showing more dispersion across strategies with merger arbitrage, market neutral, and absolute return strategies doing best while special situations, distressed, event, and direction equities having a bad year. Merger arbitrage has seen significant deal flow which allows for more trading opportunities. Fixed income credit and relative value arbitrage have not been able to find opportunities in this low volatility environment and higher expected rates. 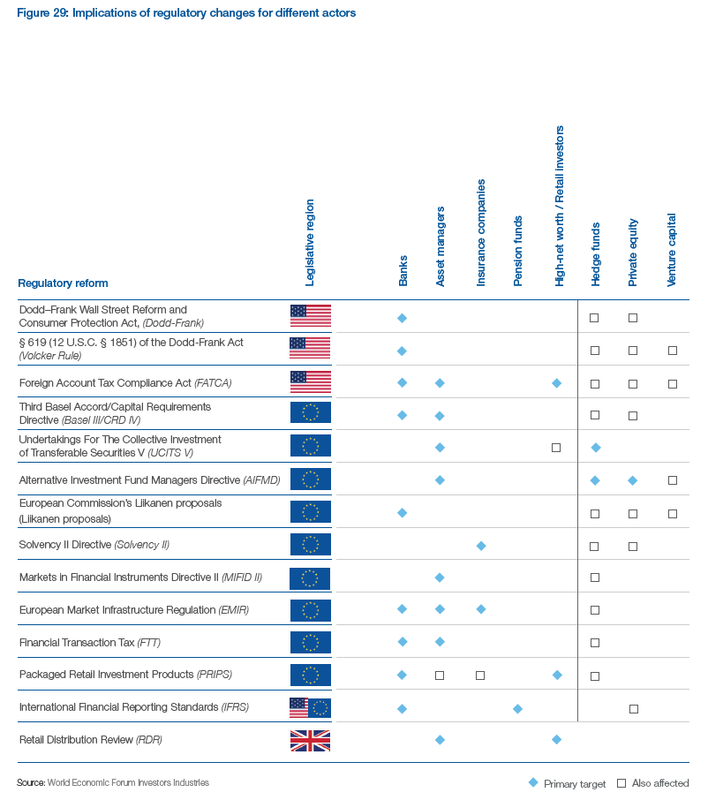 With one month of trading to go for 2015, it is unlikely there will be much change in the relative and absolute rankings between hedge fund styles or traditional indices. We expect the FOMC meeting will be the highlight of the month and after which there will be limited trading. In fact, while many believe a rate hike is a done deal, positions are likely to be pared before this big announcement. At current returns for traditional equity and bond benchmarks, hedge funds have not delivered on their promise of either higher alpha or better absolute return. Even with growth in alternative investments, this performance is likely to lead to manager shake-outs and more relative adjustments in portfolios. The SocGen CTA index gained 2.7% for the month of November placing the returns for the managed futures index in positive territory for the first time since May. The CTA index is now above the Barclays Aggregate bond index and only slightly below the returns for the S&P 500 stock index. The good returns were caused by getting the direction of the main market exposure correct because the size of the market moves were quite modest. Stocks around the global ended the months in a tight range. Bonds gained for the second half of the bond but generally yield curves flattened on rising short rates under the expectation that the Fed will raise rates in December. Metals, energies and agricultures were all generally down for the month with declines of over 4 percent in the energy complex. Currencies continued to follow trends based on the expectation that the dollar will still strengthen in response to Fed action. It was noticeable that the most liquid markets had some of the largest moves so those funds that focused their trades in energy, currencies and bonds were able to generate good returns. A decline in volatility also helped managers with signal generation and position sizing. Generally, we find managers do well in lower volatility shallow trend environments where price signal to noise ratios are more well-pronounced. There has been some grumbling by investors about managed futures performance this year, but the index suggest that returns, albeit modest, may prove to be acceptable relative to traditional assets. This table is from the latest research piece by Andy Lo and shows in a heat map the benefit of different hedge fund styles. The dedicated short bias has the lowest correlation relative to all of the other styles for the simple reason that most hedge fund states have a long bias. An investor is buying a different view. 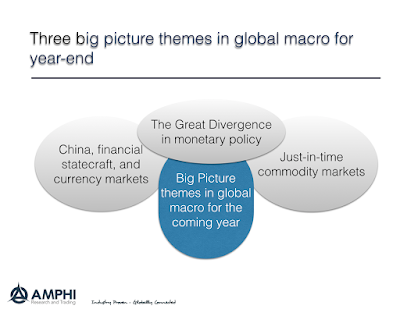 The next two styles that have the most diversification benefit are global macro and managed futures. These two should be the diversifiers of choice for any investor once the decision to hold alternative investments is made. A two step process may be an effective approach. First, determine whether you want diversifiers or substitutes and then second, choose the best managers within the style space. No different than the work on strategic asset allocation, the allocation decision may matter more than the manager selection. Futures ecosystem - the extinction of the FCM species? The consolidation of FCM's in the futures industry will continue and some may ask the question why FCM are needed at all given a greater portion of the fees from trading goes to the exchange. 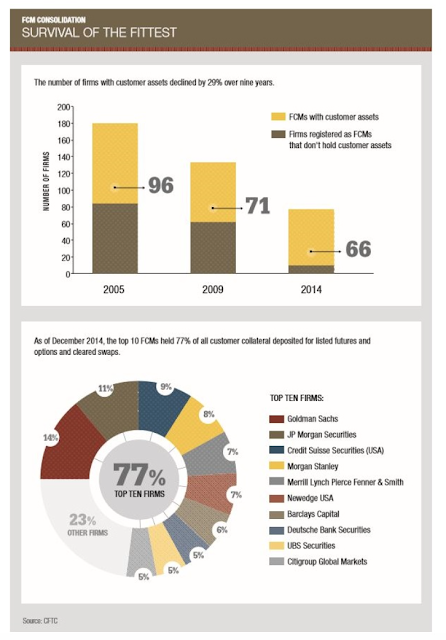 One third of all FCM's holding customer funds have disappeared in the last decade. It is unlikely that we will see another 30 disappear, but it is not clear how profitable this business can be for firms. 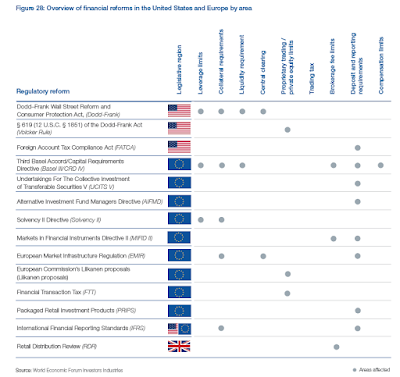 The top ten FCM's are all associated with banks and not stand alone entities. The chart from the FIA tell the story. If you are a small fund or small hedger or if you do not have the right credit, you will not have a place to trade. The system will not work for you, and CME's ads about the marketplace for hedging risk will be just a dream. Of course, costs will go up and there will be point where brokerage and clearing will be profitable, but it will be at the expense of the small trader. Perhaps I am exaggerating, but which one of the top ten clearing firms will want to service smaller firms? We have written about the decline in FCMs and how the futures industry is in upheaval in our past posts, The futures industry ecosystem is broken, Basel II and futures clearing, and Futures industry changing structure. This problem will not go away and may in fact get worse at the point where more will need financial hedging services, and industry leaders do not seem to really care. 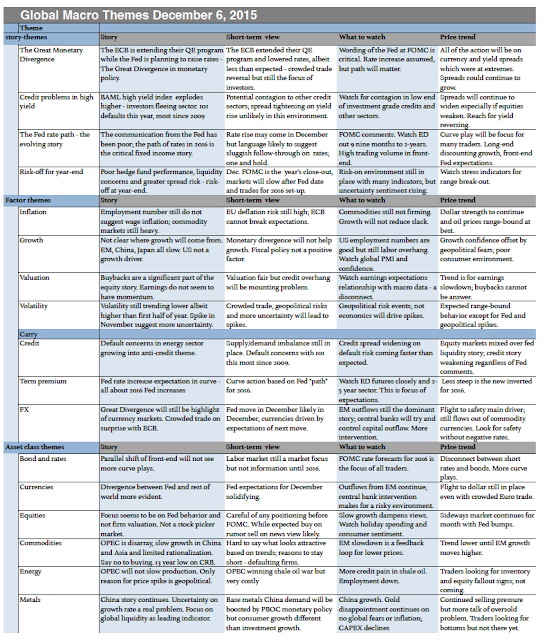 The CAIA and AIMA groups developed a hedge fund framework for trustee which provides a good introduction on how to classify hedge funds for a portfolio. Cutting through all of the issues of alpha and beta focuses on two large groupings, substitutes and diversifiers. 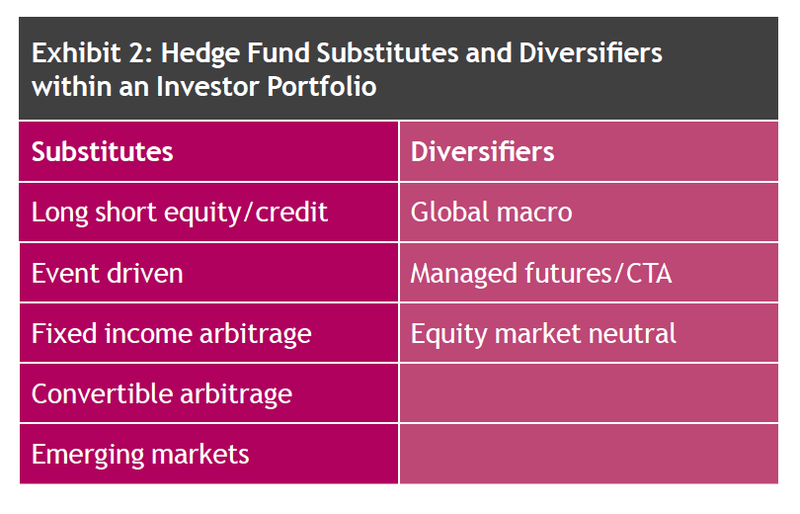 Now all hedge funds will provide some diversification versus a traditional equity and bond investment, but the degree of differences matters. The substitutes are those hedge fund strategies that can fill-in as an alternative to a equity or bond investment with less risk. If an investor does not want as much directional risk, he can sell bonds and buy a fixed income arbitrage fund. If an investor wants less directional equity risk, he can buy a long/short equity fund. There will be exposure to stocks or bonds but at a lower beta and a higher likelihood of alpha. 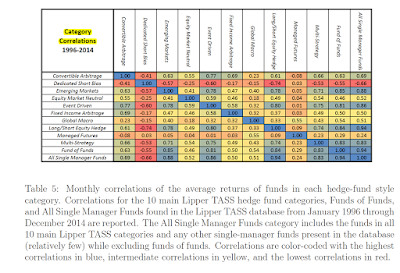 The diversifiers are hedge fund styles that will provide a greater degree of diversification because the correlation will be low and potentially negative during "bad times", those periods when equities do poorly. 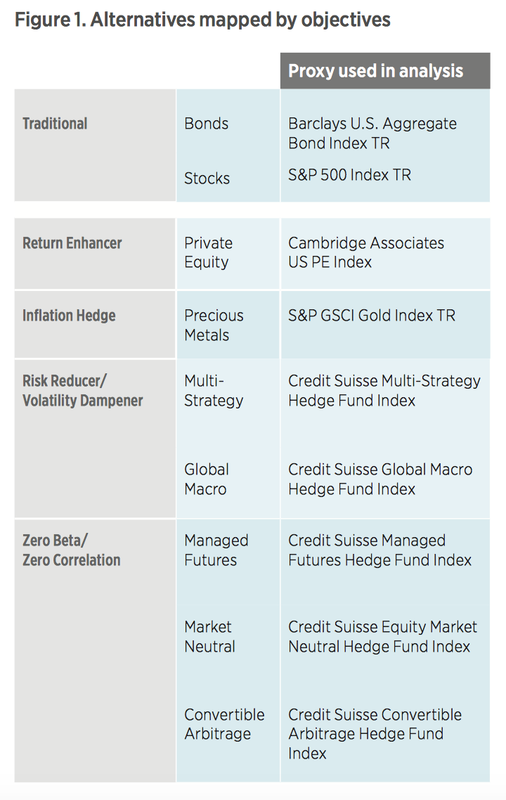 The diversifiers include managed futures, which have low correlation during crises, global macro which will take large beta bets from both the long and short side of the market, and equity market neutral which reduces most of the market beta. 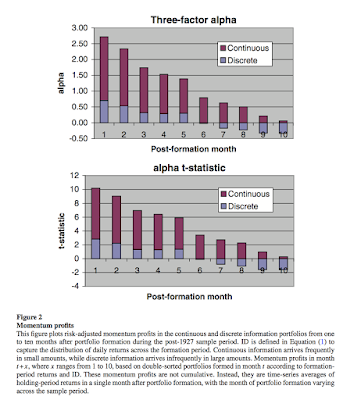 Substitutes look to lower volatility and add alpha. Diversifiers look to dampen volatility through dynamic beta. This simple framework makes the question of choosing hedge fund styles very simple. 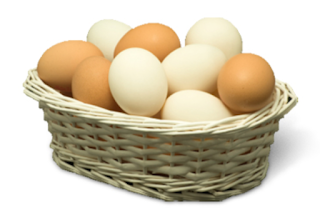 Do you want a substitute for market exposure, or do you want diversification protection? Answer the macro question and then focus on the right managers within these two major classification.